1950s:teen boys, girl and woman count ballots from ballot box as man looks at tally on clipboard in school hallway. hd00:22UNITED STATES 1950s: Students Walk Along Path Outside School Building. Students Sit in School Canteen Drinking Milkshake and Chatting. Two Boys Flick through Magazine in Canteen. hd01:10CIRCA 1960 - Bill is shown the Nike Zeus missile at White Sands, New Mexico. hd01:09CIRCA 1916 - A priest administers the last rights to a dying soldier as rebels are treated in Presidio, Texas during the Mexican Expedition. 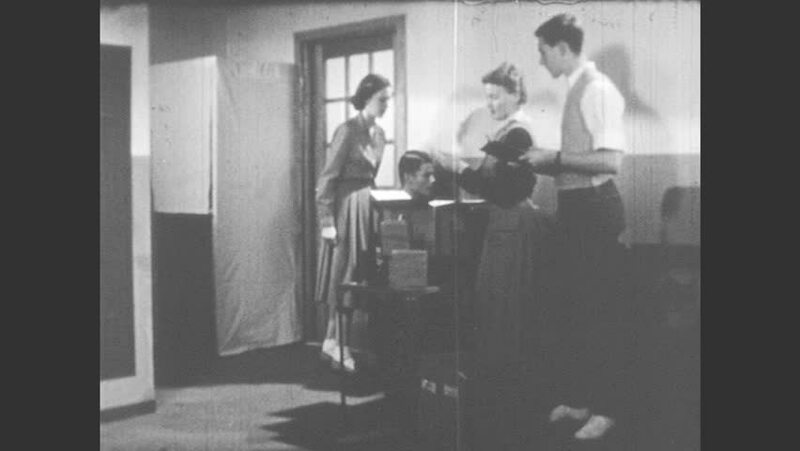 hd01:38CIRCA 1943 - Uruguayan students dancing in a living room, sift through records, and couples have conversation. hd00:14UNITED STATES: 1950s: Henry Ford country dances. Henry Ford with grandchild. hd00:18UNITED STATES 1950s: Man Attends to Patient's Foot in Clinic.